Settlement is the process by which the money paid by your customers is transferred into your bank account after deducting the transaction charges. To receive the payments in your bank account, you will first have to verify your bank account registered with PayUmoney and upload the required documents along with signed service agreement. Once website and documents are verified, payments will be automatically transferred to your bank account in cycles of 2 working days from the successful transaction date (excluding bank holidays). The time taken to settle an International payment is the same as that of a normal (Domestic) transaction i.e. in cycles of 2 working days from the successful transaction date (excluding bank holidays). 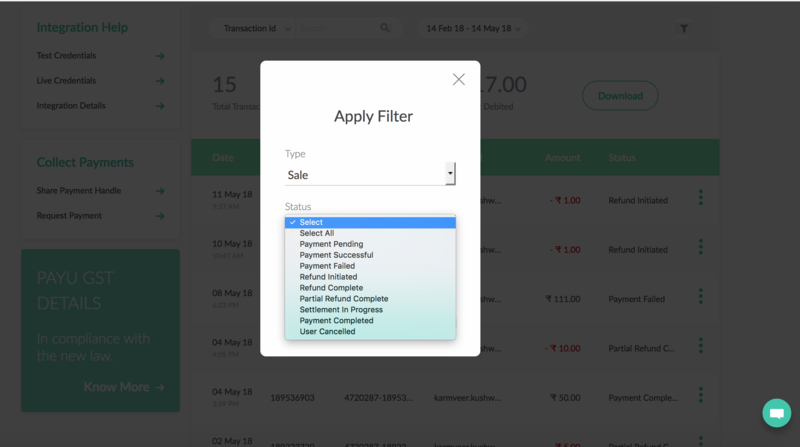 You can then 'Filter' the results by Transaction ID, Type, Date, Status & Source. User Cancelled: Customer cancelled the transaction. 'Login' to your PayUmMoney Account Dashboard. You can also download the report. Please click on 'Generate Report' on the left panel under TDR Report. Kindly drop in a request via our contact us page. Please select ' Settlement Related’ in the Issue type dropdown. We will be happy to help you. Kindly drop in a request via our contact us. Please select ' Settlement Related’ in the Issue type dropdown. We will be happy to help you. To change any of your Bank Details (Account Number, IFSC code, Bank Address), kindly drop in a request via our contact us. Please select 'Settlement Related’ in the Issue type dropdown. We will be happy to help you. Kindly drop in a request via our contact us page. Please select 'Settlement Related’ in the Issue type dropdown. We will be happy to help you.